Bound is a word used in different contexts just like found. It is also a past tense and past participle of bind, and can be used as a separate noun in completely different situations. In this grammar.com article, let us explore the words bind, bound and related forms. Happy reading! Bind – to bind is to fasten objects together tightly. For example, glue is a binding material that binds paper with another surface, water binds the flour, a common cause binds people. · Music binds all of us together. · The binding is quite predictable considering both the materials are viscous. · Bind the flour nicely by mixing some water and oil to it. · Spiral binding makes the books easier to open and keep. The usage of the word “binded” as past tense for bind is incorrect. Bound is the correct past tense of bind. · Her hands and feet were bound to prevent her from moving. · He was bound to the company because of the 2 years contract. The origin of bind comes from a combined root of German bindan and the Sanskrit bandh. The past tense of bound is bounded. · The school was bounded by a big fence, which has now been removed as part of renovation. · The rat bounded out of nowhere and scared us. So, the basic difference between bind and bound (as a separate word) is that bind is used to indicate joining or uniting several things, and bound is to set a limit on something. Boundless, the antonym of bound means infinite or something that doesn’t have any boundary. Example, boundless opportunities, mother’s boundless love and so on. Bound is the past participle of bind and bounded is the past participle of bound. · The ball bounds on the floor vs the ball bounded on the floor. In the above sentence, both are correct. One is the present tense word ‘bound’ which means a leap, the second uses ‘bounded’ which is the past tense of the same word ‘bound’. · He was bound by a contract vs he was bounded by a contract. In this case, the second sentence is incorrect. Here, conceptually the binding is there between the contract and the person who has signed the contract. · The mixture binded well because of precise combination of ingredients vs the mixture bound well due to the precise combination of ingredients. Binded is an incorrect word, the correct past tense of bind is bound. Rebound is a type of bound where the leap or impact results in a movement back from the impact. · She is still on the rebound after she lost her job. · The ball rebounded after hitting the rock. Hope the article was informative enough to get you started on binding with your friends over coffee and bounding your phone time! "Bind vs. Bound vs. Bounded." Grammar.com. STANDS4 LLC, 2019. Web. 22 Apr. 2019. 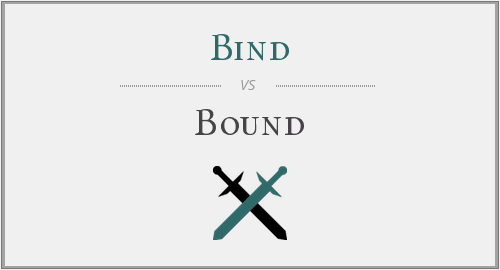 <https://www.grammar.com/bind_vs._bound_vs._bounded>.